There are now many 4K camera options for shooting video, but which camera does it best? Whether you’re moving into video for the first time, or upgrading an older camera to cope with a demand for premium-quality 4K video, you’ll find the best 4K cameras for filmmaking that you can buy right now – at all budgets – in this handy guide. We look at the best action camera category separately – this guide is for interchangeable lens cameras. There's always been a crossover between photography and video, but it's only in the last few years that consumer-level stills cameras have been marketed specifically towards both camps. Whether they use a DSLR or mirrorless camera, photographers are increasingly being asked by clients to shoot video as well, and camera makers are incorporating ever-more sophisticated video capabilities in mainstream stills cameras. It’s a revolution we can’t ignore, and neither can today’s pro or semi-pro photographers. If you're shooting for your own interest or projects, you might want to take a look at our list of best cameras for vlogging, too. 4K cameras come in a range of sensor sizes, including the Micro Four Thirds format used by Olympus and Panasonic, APS-C cameras from Sony and Fujifilm, and full frame cameras from Canon, Nikon, Sony and Panasonic. Larger sensors give lower noise and a more 'cinematic' shallow depth of field effect, but sensor size is not so relevant in the video market where sensor and film formats have traditionally been smaller than for stills. Here, we’ve gathered together seven of the most interesting 4K cameras that cater for both stills and video across a range of price points – including two specifically video-centric models to see what they do that’s different, and why many pros choose to pay the extra for dedicated video cameras. What all these cameras have in common is the ability to shoot in 4K. Not everyone needs a camera with 4K video, of course, as Full HD (1920x1080) video will be fine in many instances. But 4K is rapidly becoming a mainstream specification, and it’s also a way of future-proofing your content for clients, so that a video you shoot today has the quality they need in five or ten years’ time. The X-H1 is Fujifilm’s top APS-C-based, X-mount camera, and the first in the Fujifilm X range to feature in-body stabilisation (IBIS), which works alongside the optical image stabilisation in many Fujifilm lenses. The X-H1 can capture both UHD 4K and DCI 4K video, with a bitrate of up to 200Mbs and an F-Log gamma option. It also comes with a new Eterna Film Simulation mode, which can be used with the camera’s 400% dynamic range setting for up to 12 stops of dynamic range and less grading work compared to log modes. There is a crop factor when shooting 4K video, but it’s relatively small at 1.17x. With crystal-clear footage both indoors and out, what it lacks in high-end video specifications is made up for by out-of-the box 4K quality. In our tests, this 4K camera gave the best results with the least effort. 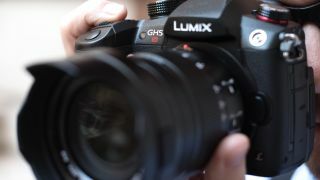 Panasonic has made 4K crossover cameras its speciality, but with the GH5S it’s gone a step further, sacrificing outright resolution for high-end video features. The 10MP sensor dents its appeal for stills photography, but it's ideal for 4K, especially as this is a Multi Aspect sensor. This allows it to shoot in both the 17:9 Cinema 4K and 16:9 4K UHD aspect ratios, in addition to regular 3:2 and 4:3 stills ratios, without the focal length changing as you alternate between these. Uniquely amongst crossover cameras, it can capture 4:2:2 10-bit video internally to suitably fast SD cards. The GH5S also comes with Panasonic’s V-logL log mode pre-installed for extra dynamic range, and while most rivals have a maximum 30min recording time, the GH5S supports unlimited recording (up to the capacity of the memory cards used). Performance is first rate, capturing great clarity, contrast and colour straight out of the box. The C300 Mark II is in the middlemost model in Canon’s Cinema EOS range, and while it’s substantially more expensive than any of the DSLR/mirrorless crossover 4K cameras in this group test, it goes a whole lot further towards meeting the needs of professional videographers, with a modular design better suited to attaching external monitors, grips, rigs and sound equipment. It uses a Super 35mm CMOS sensor similar in size to APS-C and corresponding to the old 35mm movie format. The 8MP sensor captures 4K video directly without cropping, pixel binning and oversampling, and it can capture 4:2:2 10-bit footage internally to twin CFast memory cards. It can also capture raw 4K to an external recorder. The built-in ND filters are a major asset outdoors, and there was no visible rolling shutter effect at all in our panning tests. However, the ponderous handling, reliance on post-capture colour grading and Canon’s tricky MFX file format make this a 4K camera for experts, not amateurs. Sony has carved out something of a reputation amongst videographers with its full-frame mirrorless cameras. The A7S II is arguably the most video-centric of the A7 series models, but it’s also the oldest and strongly tipped for an update any time soon, and we don't yet know any more about the long-rumored Sony A7000, so we’ve selected the A7R III for this comparison, offering as it does practically the best of all worlds for both stills and video shooters. With a 42.4MP sensor, it offers the second highest stills resolution of all the cameras on test here, and can capture either full-frame 4K video or 5K oversampled video in its cropped Super 35mm mode, which Sony says offers the best picture quality. HLG (Hybrid Log Gamma) mode is included, plus S-Log2 and S-Log3 modes for higher dynamic range capture. The colour rendition is very good, but while the full-frame 4K is useful for avoiding lens crop factors, we’d go for the sharper Super 35mm crop format. When it comes to cameras with 4K video, Olympus has not built quite the same reputation as that of other Micro Four Thirds camera maker Panasonic, but its OM-D E-M1 Mark II still offers some powerful video tools for stills shooters. It can shoot both 4K UHD (3840x2160) and Cinema 4K video (4096x2160) at 30 or 24fps, and with a maximum bitrate of 237Mbps, which is pretty good for a consumer-orientated crossover camera. It also benefits from Olympus’s 5-axis in-body stabilisation system, which works alongside the optical stabilisation in certain newer Olympus lenses. The M.ZUIKO Digital ED 12-100mm 1:4.0 IS PRO is the perfect parter for this camera, combining an effective 24-200mm focal range with a constant f/4 maximum aperture and its own in-built stabilisation to provide a combined stabilising effect of up to 6.5 stops. The Olympus captures crisp, clear and natural-looking video with only slight rolling shutter effects, but it’s harder to get cinematic depth of field with the smaller Micro Four Thirds sensor size. As a high-resolution multi-purpose DSLR, the Nikon D850 is more or less a direct rival to the Canon EOS 5D Mark IV (number seven in this list). It does, however, offer both higher resolution and, via an optional battery grip, higher continuous shooting speeds. Its advantage for video is that it captures full-width 4K video with no crop factor, so your lenses have the same angle of view for video as they do when shooting stills. Another advantage is that it can output clean 4:2:2 8-bit 4K video to an external recorder, while the external output on the EOS 5D Mark IV is restricted to Full HD. There are no log modes, which is a pity, and the D850 relies on contrast-detect AF when shooting video, which slows things down a little. The video quality itself is very good indeed, though with moderate rolling shutter if the camera is moved too quickly. Canon has always been ahead of the curve in the DSLR video market, and the EOS 5D Mark IV is an all-rounder that has proved a big hit with pros for its durability, versatility and affordability. The camera shoots 4K video too, although there are some limitations to be aware of. First, the 4K video mode does not use the full width of the sensor, so there's a fairly substantial 1.74x crop factor in this mode. Second, while the camera does support Canon’s Log Gamma mode for extended dynamic range, this is only via a paid upgrade at a Canon service centre. Most surprisingly, it can only record 4K to internal memory cards; you can use an external HDMI recorder but only for Full HD footage. The camera's Motion JPEG video files are huge, and the 4K crop factor makes wide-angle framing more difficult, but the quality proves very good in both our outdoor and indoor tests. Our tests did, however, show rolling shutter to be the worst in this group. 4K UHD vs Cinema 4K: What most people refer to as ‘4K’ is actually UHD, or 3840x2160 pixels; it’s not quite 4,000 pixels (or 4K) pixels wide. However, it does have the same 16:9 aspect ratio as Full HD, with twice the horizontal and vertical resolution. Actual Cinema 4K, which is often referred to as DCI 4K, has a resolution of 4096x2160 pixels, with a slightly wider 17:9 aspect ratio. Autofocus: Most camera makers now offer fast hybrid phase- and contrast-detection autofocus systems, though Nikon DSLRs still use contrast-detect autofocus in live view and during video recording, and Panasonic’s Depth From Defocus (DFD) contrast-detect AF is really fast. In reality, though, many videographers prefer manual focus. Bit depth: Most cameras capture 8-bit video, which has similar limitations to 8-bit JPEGs and can start to break up and show banding or posterisation effects with heavy editing (or ‘grading’, to use the video term). Some cameras can capture 10-bit video, which offers more scope for editing later. Bitrate: The level of compression applied to video footage. As a general rule, higher compression (a lower bitrate) produces smaller files but lower quality, while lower compression (higher bitrate) produces larger files but better quality. Cine lenses: Regular lenses are fine for video but cine lenses have special adaptations that can make video easier or better. They use T-stops (actual light transmission values) rather than F-stops, and many have ‘declicked’ aperture/iris rings for smooth and silent exposure adjustment. Some also have toothed rings that engage with professional pull-focus mechanisms. Colour sampling: Video is recorded as a luminance channel and two chroma channels. Compressing chroma (colour) data is less harmful to the image quality and this compression is quoted as a ratio. In the perfect world, cameras would record 4:4:4 video but usually the chroma channels are compressed, for example to 4:2:0 (basic) or 4:2:2 (better). Crop factors: Not all cameras capture 4K video across the full width of the sensor. Regular stills camera sensors have a higher resolution than is needed, so some makers will crop the sensor area to reduce the image processing overhead or achieve a simple 1:1 pixel ratio for 4K video. This produces a potentially annoying crop factor. External recorder: Video cameras can record compressed video internally to memory cards, but you can usually record ‘clean’ (ie uncompressed) video to an external recorder via the camera’s HDMI port, too. This offers potentially higher quality and greater storage capacity, and many of these have large displays that let you see the scene more clearly. Frame rate: The traditional frame rate for movies is 24fps, whereas for PAL broadcast TV it’s 25fps and for NTSC broadcast TV it’s 30fps. Now that most video is transmitted and viewed digitally, the old distinctions between PAL and NTSC are less relevant but the frame rate still affects the look of the video. Interlaced vs progressive: Interlacing is an old technology where two fields of odd and even scan lines are stripped together. It saves on processing power and bandwidth (for broadcasting) but the quality isn’t as good as progressive video, where each frame is captured in its entirety. Interlaced video has an ‘i’ suffix after the frame rate, progressive video has a ‘p’. Intra-frame vs inter-frame (IPB): Intra-frame compression compresses each frame individually and gives the best quality frame by frame. Inter-frame compression only stores the changes between key frames. The choice may be expressed as ‘All-I’ (intra-frame) and ‘IPB’ (inter frame) compression. Log modes: These capture ‘flat’ video with a wider brightness range designed for editing (grading) later. All camera makers have their own versions of log modes, such as S-Log (Sony) and C-Log (Canon). Log modes are a selling point for video-orientated cameras. Microphone: the camera’s internal microphone, stereo or otherwise, will not have the sound quality or directional sensitivity for good-quality video, so an external mic is an essential accessory. You can use directional ‘shotgun’ mics like this RODE VideoMic Pro, or a wireless lapel or ‘lavalier’ mic for clipping to clothing to record speech. LED lights: naturally, flash is no good for video, so if you intend using artificial light it will need to be continuous lighting. LED panels are the top choice for video because they run for a long time off battery power while providing good levels of lighting and low heat levels. Some also offer variable colour temperature for matching the colour of different light sources. Live view: Mirrorless cameras have an advantage because they offer full-time live view both on the rear screen and in the viewfinder. DSLRs only offer rear screen viewing because they have to shoot video with the mirror up. Oversampling: A processing technique where video is captured at a higher resolution then downsampled to 4K resolution. This can produce better quality and is sometimes used on cameras where the native sensor resolution is much higher than 4K. Pixel binning: A way of combining the output from photosites so that a higher-resolution sensor can be used to produce 4K resolution video. It’s not considered as good, in quality terms, as oversampling. Sensor size: 4K crossover cameras come with a range of familiar sensor sizes, including full frame, APS-C and Micro Four Thirds. Super 35mm is a sensor size used in cinematography some pro video cameras – it’s roughly the size of APS-C but with a wider aspect ratio. Tilting screen: Very useful when filming at low angles or ground level. Fully-articulating screens are less important for video because you never shoot with the camera held vertically. Video tripod and head: A dedicated video tripod, such as the Manfrotto tripod above, will have twin legs for extra stability and vibration reduction, and a fluid head with a long panning arm will provide much smoother camera movements. The Manfrotto Nitrotech N8 has both these features, together with a counterbalance system that prevents the camera drooping forward when it’s released. Zebra: A tool provided by many recent cameras that's used to help judge exposure. This displays the areas of highlights in the frame, and the user will typically have control over the threshold to better manage detail in these areas.